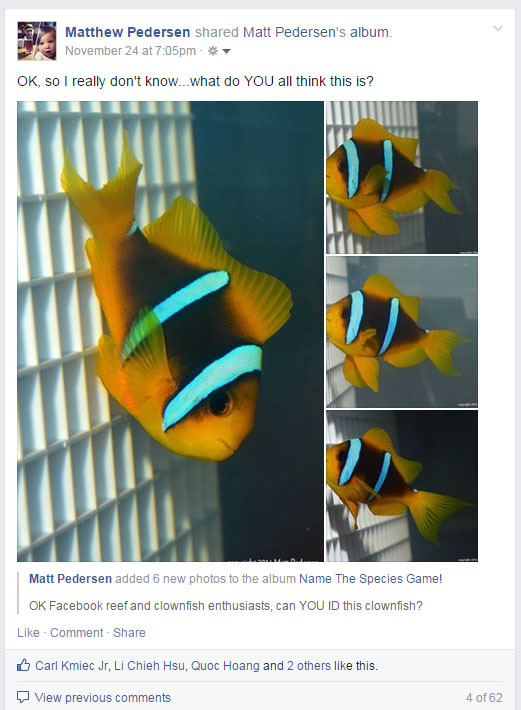 ﻿ Can Facebook Identify a Clownfish? Can you ID this clownfish without any additional information? 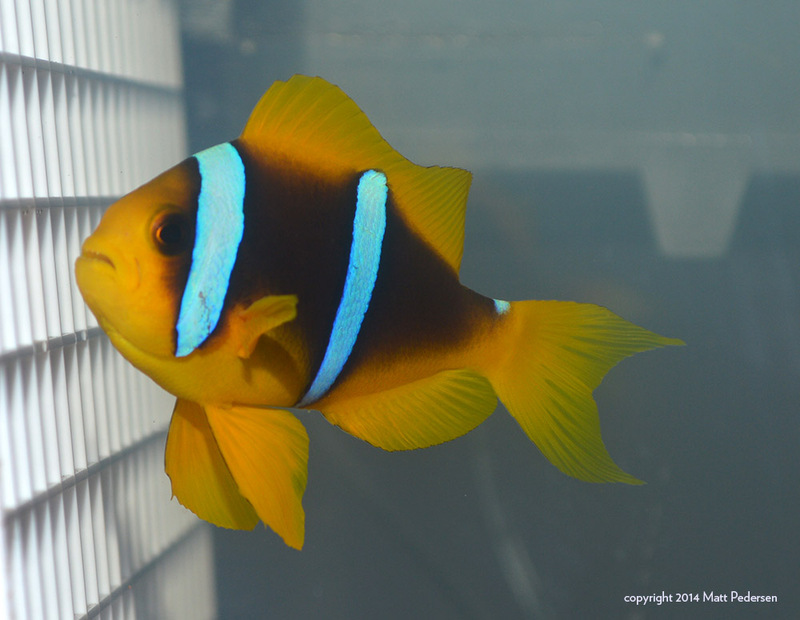 A few weeks ago I received an extremely impressive single-box shipment of clownfishes from Walt Smith International [full disclosure, Walt Smith is a CORAL Magazine advertiser…the fish I obtained were purchased at a premium for my breeding projects]. I’m not going to talk about everything that was in the box right now [yes, I’m kinda sitting on a secret, not a big one, but I don’t want to tip my hand just yet]. The arrival of the fish gave me an opportunity to run an informal experiment on Facebook, the ubiquitous social-media platform that seems to be taking over our daily lives and is eroding our ability to communicate, to reference, and to deal with legitimate businesses. There is a lot I could criticize Facebook for, but the main bone of contention today is the smoke & mirrors aspects of it. Facebook has made it incredibly easy for virtually anyone to make themselves appear in a position of authority. Case in point, anyone can start a “Facebook group” and simply start adding people to it—20,000 self-added members later, and you are now the “leader” of the “biggest internet group interested in XYZ”. Start up a business page, pay for “likes” and what was a legitimate presence and size for a new small business (eg. 100-250 people liking) suddenly becomes a massive following in the 10’s of thousands that even the likes of CORAL Magazine might envy at first glance (I’m proud to say that every last “fan” of our social media pages are hard-earned, organically obtained likes, save the odd person here or there that discovers us through an advertisement we may run. Our audiences are real people who we didn’t pay to like us to bolster our numbers). Unfortunately for the aquarist on the street, it’s impossible to tell whether a Facebook page or group has a genuine massive following by virtue of actually being that relevant and important, vs. simply being “shilled up”. Either way, just because you have 10,000 people in the room, doesn’t mean there’s 10,000 experts in the room. More often than not, I’ve seen misinformation being provided to people seeking answers, often to the very same basic beginner questions. Internet forums are already bad enough with a “you get what you pay for” disclaimer on their content, but it seems the problems are even more recurrent on places like Facebook. The problem is amplified particularly in the Facebook groups with people often in desperate need of answers, and wanting those answers quickly. I can almost guarantee you’ll get quick answers on most active Facebook groups. Helpful or correct answers, well, that’s another question. I wondered….If I put up a photo album of an off-beat clownfish, one that’s not seen every day in every shop, and ask people to help me identify it without any additional information, what would happen? 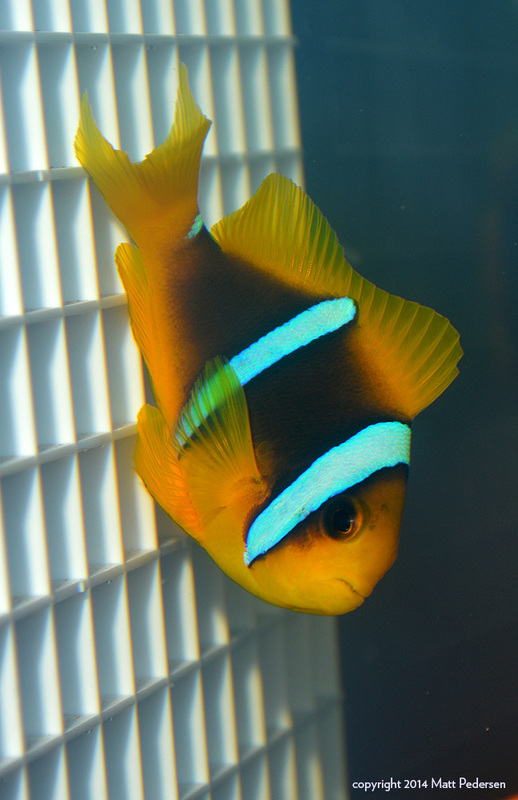 OK Facebook – can you ID this clownfish for me? I posted the photo album to my “public” Facebook page (which I keep separate from my private, folks I know personal page) and then shared it around Facebook to various communities. It went out to my friends, groups of clownfish enthusiasts, and even total strangers. In short, only 26% of responses got the species correct, being the Blue Stripe, A. chrysopterus, in this case the yellow-tail, yellow-fin form from Fiji. Here’s a look at this fish, along with several other examples that came in the shipment. 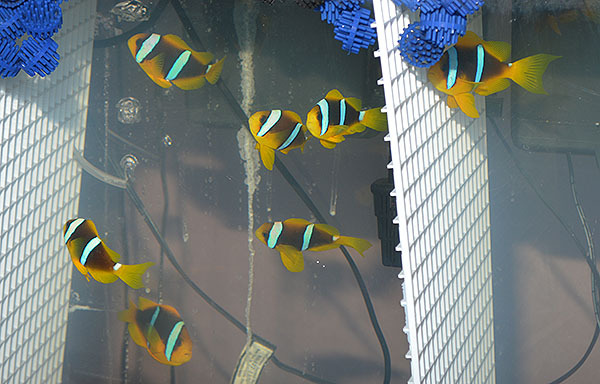 Several examples of medium-to-large sized Amphiprion chrysopterus “Fiji”; most did not have as pronounce tail extensions as my experimental fish, seen here on the right side of the divider. 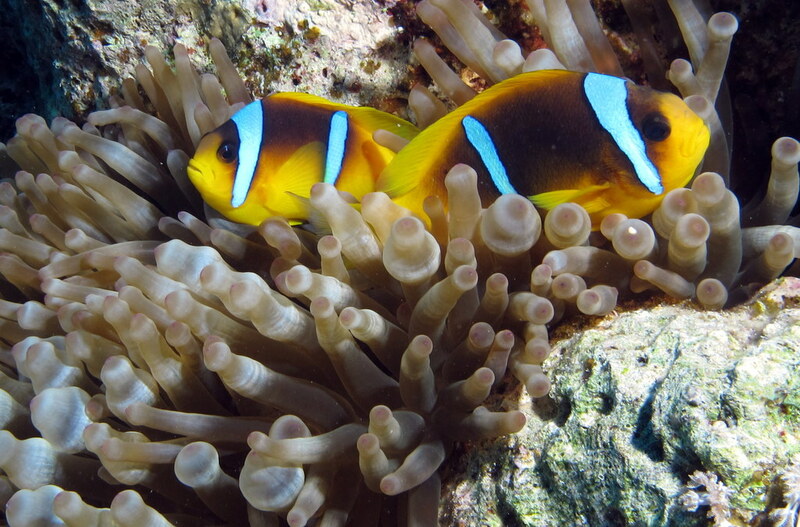 What I had honestly anticipated was that many folks would misidentify this clownfish as being the Madagascar, A. latifasciatus, due to its very obvious lyre tail. That, and their recent run of fresh noteriety due to Ross DeAngelis’ success in breeding the species for the first time this year. Thankfully, my closest friends didn’t disappoint, as most of the mis-IDs for A. latifasicatus came from people I knew well (but I wouldn’t necessarily think of as clownfish experts in any sense). I suppose it speaks highly of their opinion of me for them to think that a) I could afford this very rare species and that b) if I could afford it, I’d actually know where to get it! In total, 14% of responded answered in the manner I expected, mis-IDing this fish as A. latifasciatus. What really surprised me was the high number of identifications for the Two Stripe, A. bicinctus, from the Red Sea. I was even more surprised at how difficult it could actually be to tell the two forms apart seeing them side-by-side! With 19% claiming this ID, it’s hard to find fault, as visually they are extremely close. What this really hit home with me was a simple reiteration that provenance really matters when it comes to purchasing fish; it may well be that he only way to reliably know that this fish is A. chrysopterus and not A. bicinctus is knowing it was harvested from Fiji! Note, one of the only apparent visual cues may be the differing shape of the headstripes, with that of A. bicinctus being more wedge-shaped, a trait it shares with the related A. allardi (which also is similar to the white-tailed, yellow-finned form of A. chrysopterus). But even this potential diagnostic probably has some overlap and certainly isn’t enough. Provenance (known and trustworthy collecting location information) is required to ensure you know what you have in this situation. From here on out, the identifications started to deviate ever more from being close matches. The second highest response rate was for Clark’s, at an even 20%. It’s difficult to know if “Sebae” was truly meant to be A. sebae, or the name Sebae which is still often misapplied to A. clarkii in the trade even today. If I were to add in the 3 Sebae IDs and treat them as votes for A. clarkii, this would’ve been the 2nd highest response at 24%. When I look at the 6% slice occupied by other clarkii-complex species not yet mentioned, specifically Allardi and the Barrier Reef, it would bring the total for this group to 30%. Beyond that, there are the very odd gross miss-identifications that came in the form of Tomato and Cinnamon Clownfish, along with Coco and general “Hybrid”, representing approximately 11% when added together. But what I haven’t gotten to yet is the general failure of clownfish-specialist groups to get the ID right, perhaps only surpassed by the wildly off the mark reception received when I asked this question in a general reefing group. You most certainly get what you pay for. I believe I got a correct ID in just about every venue I tried, but the real problem is that the correct information was buried in a sea of misinformation. I happened to know the answer before I asked, so for me it was easy enough to know when I was getting good info, and when I wasn’t. But take that part out of the equation, and realize that 74% of the answers provided were wrong. If I picked an answer at random out of a hat, I had a 1 in 4 chance of getting the correct answer. I absolutely got a lot of answers, quickly. But had I not known exactly what the fish was, the reality is that I would likely never know. The unexpected match of A. bicinctus was so close that I’d be very torn, and without knowing where the fish had come from, I may never really know for certain. So if Facebook’s online reefing communities cannot reliably identify a fish species that is somewhat routinely imported at ongoing low levels, what CAN we really expect the community to get right? One more look at this stunning example of a Fijian A. chrysopterus, exported by Walt Smith International in Fiji. One final word of note – Aaron Dragseth nailed it. And I don’t mean he just got it kinda right, I mean he nailed it right down to the collecting location. How? Well, Aaron had had them before and knew exactly what he was looking at. So the only real problem is that Aaron’s answer was just 1, with another 69 lesser answers all piled on the heap. While I will certainly bemoan the phenomenon of the “instant internet expert”, particularly in venues like Facebook, Aaron reminds me of something I’ve been told / learned repeatedly – post count, or a recurring familiarity with a respondent, doesn’t qualify as expertise. A good idea (or good answer) can come from anywhere.